WiFi-based Real-Time Location Systems (RTLS) utilize a combination of active RF tags and access points to track the location of materials, equipment, or even personnel within a known, controlled environment. Common applications are in warehouses or shipping facilities, secure buildings, and hospitals. RTLS application software is added to servers connected with standard Wireless Local Area Network (WLAN) infrastructure, utilizing methods such as triangulation and calculation of signal strength to determine a tag location. Accuracy of location can be enhanced by equipping the tags with built-in motion sensors. 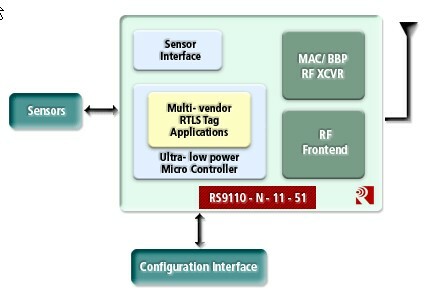 Sensors can also be added to RTS tags for triggering of alarm signals. 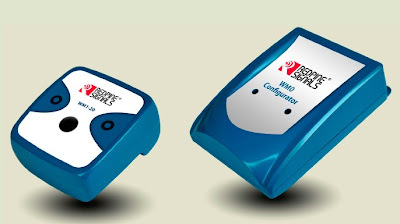 Wireless chipset vendor Redpine Signals has introduced a new WiseMote WM1-50 RTLS tag, which Redpine CEO Venkat Mattela says is the first in the industry to offer dual 2.4/5 GHz 802.11n WiFi operation. According to Mattela, thought it may be counter-intuitive, 5GHz operation can actually provide a significant power savings compared to 2.4GHz WiFi. The reason is that there are only three channels available in the 2.4Ghz IEEE-802.11n standard, while there are twenty in the 5GHz band. The tags typically operate with long periods in low power sleep mode, waking up briefly to communicate with the network. When there is a lot of traffic on the more crowded 2.4GHz band, the active period of the tag is extended, consuming more battery power. Redpine says that the WM1-50 RTLS tag supports a variety of location tracking and update schemes, including configurable beacon patterns compliant with Cisco Compatible Extensions (CCX) specifications for WLAN client devices. The companion WM0 Configurator device from Redpine enables the the tags to be configured wirelessly through low frequency signaling when they are brought into proximity. The WM0 uses a USB connection to communicate with a controlling PC. Configuration information is exchanged directly between the tags and the WM0 over WiFi, without the need to connect to the WiFi infrastructure. Redpine provides customers with a Software Developer Kit (SDK), sample applications and APIs for integration of the tags and Configurator with custom location engines.